‘Eat your stake, mom, and let me do what I’m here to do!’ Lilya growled at the phone, ‘it’s not even a proper bullfight, just a novillada!’ she added quietly, after hanging up. Her capote, muleta and sword resting on the rooftop terrace floor, she realized she’d never felt more alone. The eccentric Finnish girl. The people at home could never understand why she wanted to be part of what they called a ‘barbaric tradition of killing animals for fun’; the local bullfighting aficionados disliked her for being a female and, in addition, a foreigner; the boys she attended bullfighting classes with couldn’t stand her for having to pose in the background while Lilya would be interviewed for TV, magazines and web-sites. ‘She shouldn’t even be here, let alone be famous! She’s not that good at bullfighting – she doesn’t deserve to be where she is! This is just a study for her – she doesn’t care about it.’ Lilya couldn’t help agreeing with these and other countless accusations being showered on her: she knew as well as anybody that a bullring was the last place in the world where she should be. Yet, every evening she stubbornly climbed the stairs to the rooftop terrace, gear in hand, practiced for at least two hours and then stared blankly at the roofs of Seville, the traffic in the busy Jose Laguillo steet, the windows of the hotel next door, the dust on her shoes; very rarely did she dare look into herself. Now, the night before her first real fight in La Algaba, she felt she owed it to herself to do so. Sitting alone on her bed, barely able to breathe in her stiff suit of lights, de catafalco y oro, Lilya, was staring at the floor. 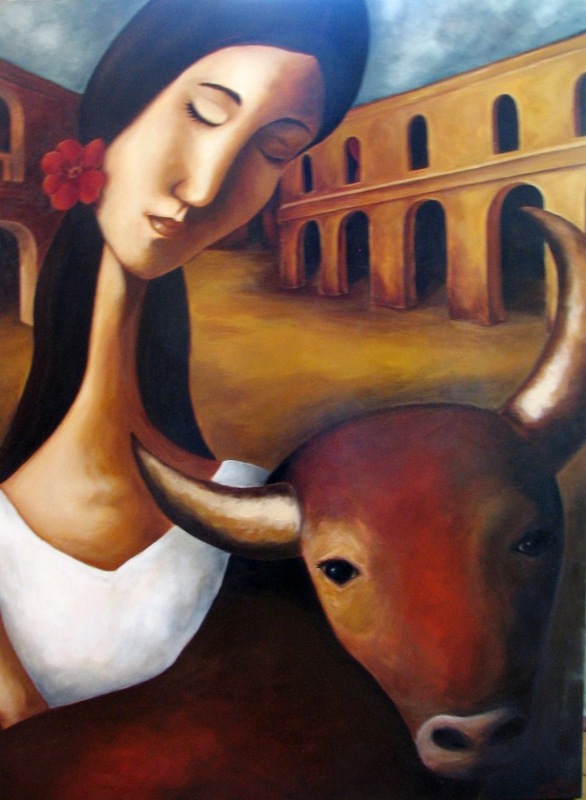 ‘Vamonos, torera!’ one of her bullfighting teachers called cheerfully, knocking on the door. Lilya’s eyes glistened in the dimly-lit room but didn’t move; her hands were shaking a little. ‘Vamos, mujer! Que llegamos tarde ya!’ Hearing no answer, he carefully pushed the door open. ‘No tienes porque hacerlo, Lilya, si no lo quieres de verdad,’ his kind whisper sounded next to her. Lowering his grey head so as to see into her eyes, he put his heavy leathery arm around the girls’ shoulders, noticeably fragile under the armour she was wearing. ‘Tu no tienes porque hacerlo,’ he repeated, ‘ya has demostrado que tienes mas cojones que nadie!’ She laughed quietly. ‘Tiene Usted razon, tenemos que darnos prisa,’ Lilya said resolutely after a moment’s pause, tension spreading down her body. She had to hit that exact spot between its enormous black shoulder blades. Banderillas sticking out of the bull’s ravaged back helped her focus and aim. The girl took a deep breath. ‘Well, you did it, Lil,’ her mother’s voice sounded from thousands of miles away, so far away that Lilya could barely hear it, her whole being full of that other sound. It was late in the evening after the fight and the girl was sitting cross-legged on the floor of her rooftop terrace. She listened carefully but couldn’t understand what her mother really meant. Slowly Lilya got up from the floor and stumbled to the edge of the terrace. Her blank stare wandered among the dark roofs, and cars, and people in the windows of the hotel across the street till it paused on a girl of about fifteen, reading behind the glass. ‘I fear I have proven the exact opposite,’ she replied.